Can handle tube diameters from 10 mm to 40 mm and lengths from 40 mm to 200 mm. ~ Automatic tube infeed with cassette loader. Simultaneous accessibility of many tube holders in case of manual infeed. Adjustable filling pump with different volumes:. – Ease in removal of pump components for cleaning and changeover. -Contact parts are corrosion resistant, – No-tube-no-fill device, – Blow off device to cut “Rat tail” of highly viscous products.- Photo-electric tube registration for automatic positioning of tube orientation. – Multiple folding stations for tube closure. – Code marking on the closure with digits and/or letters. –	Transportation of filled tubes forward and backward. Output, tubes per hour 2400-3600 depending upon tube size and product. Floor space occupied 1.2 x 0.7 m.
Height, including paste container 1.7 m; ( 5′ – 7″ ). Height, excluding paste container 1.1 m. ( 3′ ). Net weight 550 kgs (1200 Ibs). Gross weight 750 kgs (1650 Ibs). Shipping volume 3m3 (100 cu.ft). 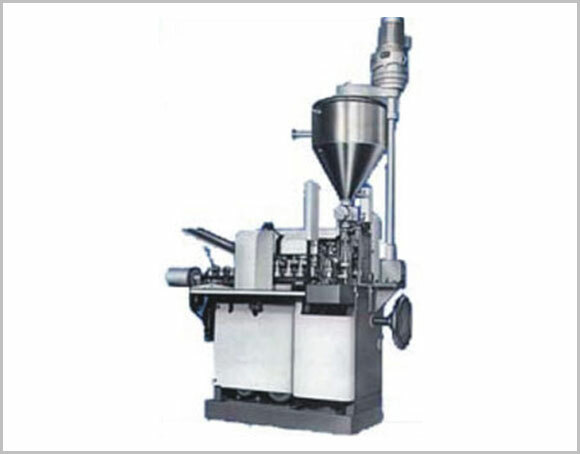 Cream stirring device, heating device, jar filling attachment, cartoner hook up, counting device, flange connection in plac of hopper, stainless steel sterilisable pump, spring loaded tube holders etc. can be provided for specific requirements.